We’ve talked several times about how people are great at coming up with excuses. We make excuses to not pursue holiness or to not stop treating women like visuals, or for not being in the Word daily. We may have even made excuses for not answering God’s call. “God doesn’t really speak to anybody anymore” or “I’m no prophet, God wouldn’t speak to me” or “I don’t really know God, how would I know if He was talking to me?” or “I’m too young. God only calls older, experienced people.” In 1 Samuel 3, we are going to see God speak to Samuel, a boy who could have made all of those excuses. Notice that Samuel didn’t dismiss the Voice. He didn’t roll over and ignore the Voice. He didn’t say “Hang on a minute,” or “It’s late, I’m trying to sleep.” He didn’t complain about being woken up; he pursued the Voice—he investigated. Samuel got up and went to ask Eli what he wanted. Samuel was sure he heard something so he went to the logical source, the only other person in the Tabernacle. Eli told Samuel that he didn’t call him and sent him back to bed. The Lord called to Samuel again and again Samuel went to Eli and was sent back to bed. Surely Samuel knew the Lord in some respect—he was serving the high priest and living in the Tabernacle! The Hebrew word for “know” in this passage is the word yada, which has several meanings. This particular usage is the same we see in Jeremiah 22 when Jeremiah is rebuking the King of Judah. Jeremiah is rebuking Jehoiakim because his actions were proving that he did not truly know (yada) God, and at this point in Samuel’s life, he didn’t truly know God either. 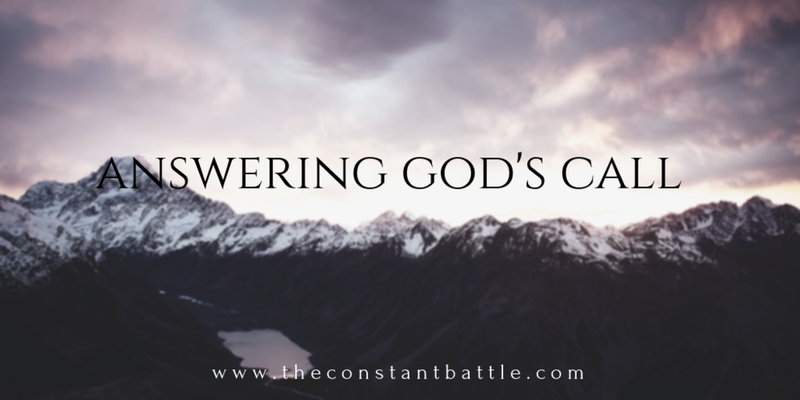 Don’t miss this: we can be serving the high priest and sleeping in the tabernacle and still not truly know God, but that will not stop Him from calling out to us. Finally God called a third time and Samuel went back to Eli. It is then that Eli realized it was God speaking to Samuel. Samuel nearly missed the voice of the Lord but he sought out the advice of someone wise. This is something we should do more often. We need to surround ourselves with wise people, people we can talk to about biblical and spiritual issues because sometimes we can hear God’s voice and mistake it for someone else’s. Now you may be trying to reason God’s voice away even as you read this. “Well that was in Bible times, God doesn’t speak to us anymore, especially like that.” Look at verse 1. We are excited to announce that our book is now available to purchase on Amazon. If you or anyone you know is new to the faith or maybe hasn’t taken all the steps to confession and repentance, this book will help in the journey to understanding this constant battle we are in and how to live free from the chains of sin. Click here to view the book on Amazon! May the grace of the Lord Jesus Christ, the love of God, and the fellowship of the Holy Spirit be with you all.